A record number of visitors attended this year event, that ran from 2nd-5th April in Vienna. Those who attended were not only treated to the beautiful city views but also the most exciting and recent innovations advances in the biologics development space, including technological advances in bioprocessing, highlights of research, and the industry’s experts’ vision of the future. Launched with a keynote address by UCB; Stefanos Grammatikos, VP Biotech Sciences, explored innovations in bioprocessing and compared the drivers of yesterday and today, in an era of intense pressure on getting a product to market quickly. Along a similar line, the next two speakers painted a picture of the current state of the bioprocessing market, as well as its future, touching upon challenges faced, predicted growth, Big Data, automation, and the need for a robust supply chain. Per Liden, GE Healthcare’s Product Strategy Manager, Bioprocessing Software, talked to efficiency in the lab and the vital role of data science in pharma: “Almost everything is measurable and quantifiable.” Indeed, engaging on the challenges of reaching success rates in an increasingly tighter timeline, is something we can relate to with our customers and partners. Unjulie Bhanot, Solutions Consultant at IDBS, a plenary speaker at the event, said, “We had a great mix of experts from the industry stop by the IDBS booth, with a lot of people taking an avid interest in our scientific data management platform and our specific solution for biologics development. As should be the case with successful events, there really was something for everyone in the industry: innovations in accelerating science, strategies for the future, new ideas on optimizing manufacturing processes, and even laying out the challenges of developing novel highly potent therapeutics. We hope to attend the next one, but if next year is too soon for you to wait to start a conversation with us about your thoughts on the biologic developments industry, then please get in touch to connect with one of our experts. 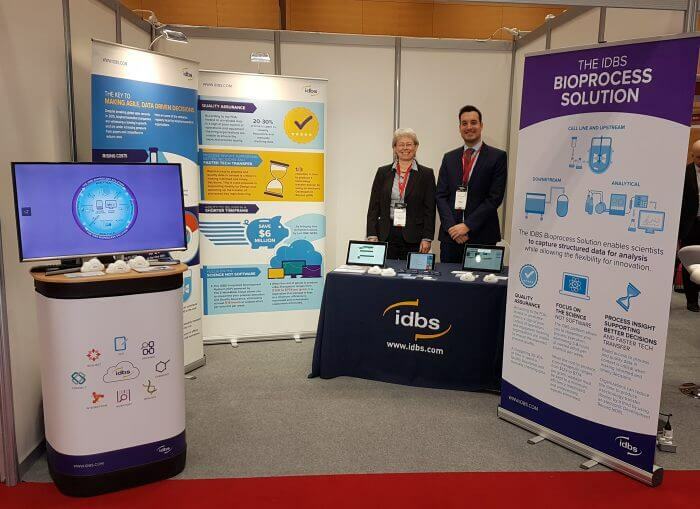 If you’d like to know more about the IDBS Bioprocess Solution, then please click here.